Assets are expensive, almost everywhere you look, but the run could continue for a while yet. CAPEX is coming and complacency is in the air, but a “bull market in everything” could be a risky call just when the central banks are heading for the QE exits. Global valuations: Breaching a ceiling? World Federation of Exchanges, OECD, and national sources. Data as of Sep-2017 (there is a delay in the publications of World Federation of Exchanges). Countries in the sample are US, Japan, Germany, UK, Switzerland, South Africa, South Korea and Taiwan. Past performance is not a reliable indicator of future results. What made it a record year for records? Finally, a fiscal push ! Where will Capex and tax reform take you? Time to dig a bit deeper? Heading to this year’s equity hotspot? Will safe havens be harder to find? Should you be nervous about normalisation? With 200+ ways to access markets and some of the world’s most innovative risk management strategies, we can help you prepare for any eventuality – good or bad. Discover a better path today. 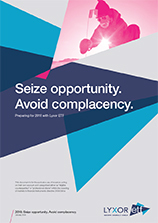 If you’ve spotted opportunities for growth, Lyxor has you covered. 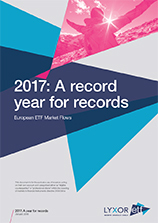 Our far-reaching range spans 110+ allocation ideas (€41.bn in equities and €7.3bn in fixed income) – many of which are among the oldest and most widely traded on the market. * You can also target specific themes and styles, as well as diversifiers like infrastructure, commodities and private equity. If your priority is protection, Lyxor has everything you need. Our market-leading range of problem solvers includes super low cost inflation linkers to groundbreaking inflation expectations strategies – the first of their kind in Europe. We also offer the cheapest Floating Rate Note ETF on the market. * Or, if you’re looking for a hedge against market drawdowns or rising yields, our short ETFs could be the solution. And, because we’ve been doing this for more than 17 years, you can count on us to keep our promises. *Source: Lyxor International Asset Management. Data as at 30/11/2017. European equities - the 2017 headliners ?